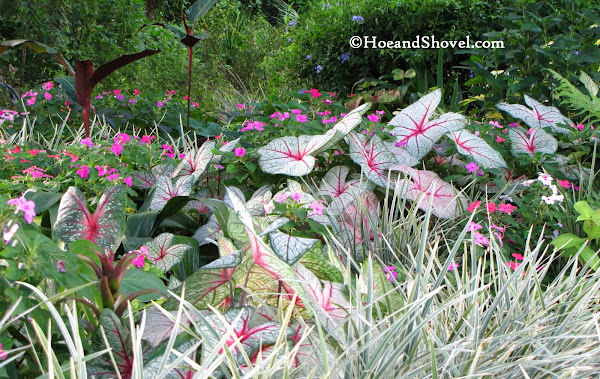 Late summer in the garden means caladiums, Caladium x hortulanum are the main attraction at Hoe and Shovel. These bright-leaved ornamental plants are becoming increasingly popular and are finally being used in more designs and all sorts of landscaping situations. Folks are finding out how easily they grow and what little care they take whether planted in the ground or in containers. Making their first appearances beginning in spring they (can) last through November in many instances. That equals a fairly short dormant period. In this climate it is not necessary to pull the tubers or bulbs out of the ground in winter. Our soil doesn't freeze even if the surface temps dip below freezing. Leaving them in the ground when dormant means I lose some to my own (digging) habits and some could possibly rot and some are dug up by armadillos that habitually root around in the soil. 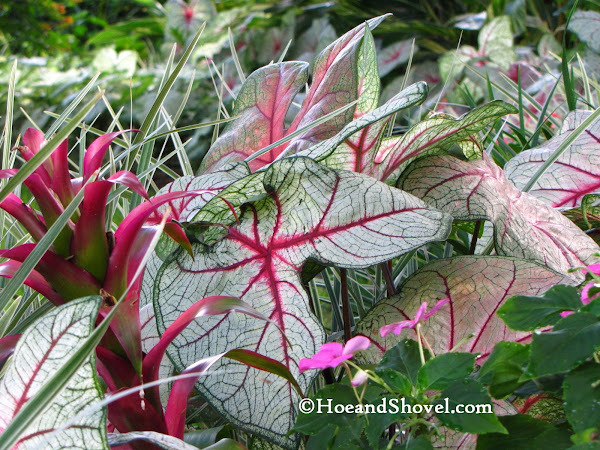 But for the most part caladiums can be counted on to return each year. Even so, it is my habit to purchase hundreds additionally each spring. Buying bulbs is much more economical than purchasing the already forced plants you find for sale in the garden centers. 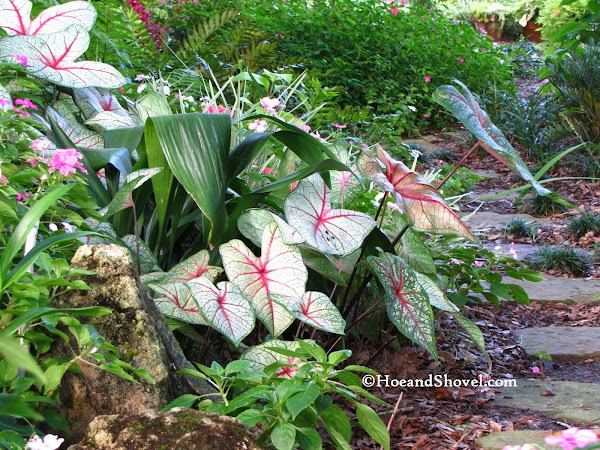 Most gardeners I know tend to be in a hurry to get their caladium bulbs in the ground as soon as spring arrives. And that is certainly okay. But I tend to wait until very late spring and even into the weeks of summer to plant my new bulbs. This year I planted some as late as last week. They come up out of the ground very fast this time of year. Waiting until later in the season to plant gives the returning caladiums a chance to emerge from the ground once the soil temps warm fully. At that point, I can better see which areas need to be filled in to add the most impact. Speaking of impact, my usual method is to plant en masse with like-varieties. But mixing them is certainly an option for an all together different appeal. It is a matter of preference. 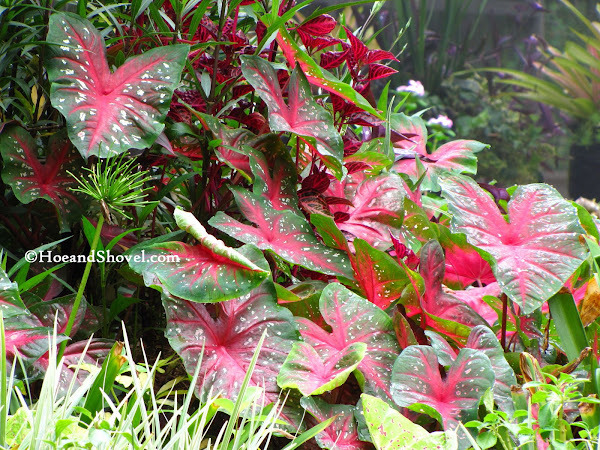 Caladiums are available in a diverse range of leaf colors, shapes, and sizes. White Queen and Florida Fantasy are among the most widely used here as their preferred white leaf with deep magenta veining shows up well in the shady parts of the garden. Although it should be noted that White Queen can emerge from the ground more green, pink, or red. Fertilizer or soil conditions or maturity can attribute to these factors. Florida Fantasy, however, is a true white leaf with deep magenta veining. Backlit, the green veining is pronounced in the White Queen. This variety is also sun tolerant. 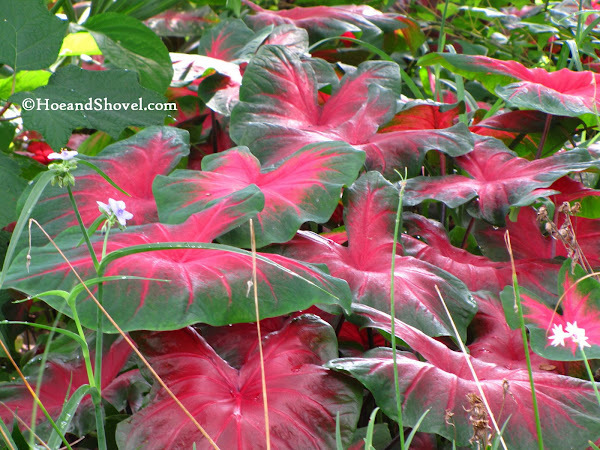 Some people have the mistaken idea caladiums can only be grown in the shade. 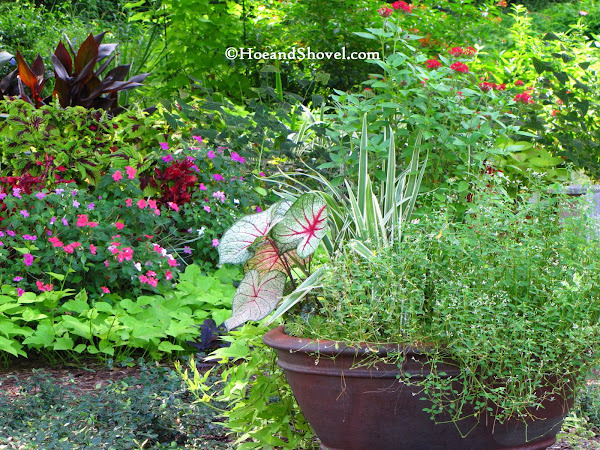 Oh, and all the impatiens you see mixed in are self-seeded. They grow like weeds in the shady garden. But that's another story. 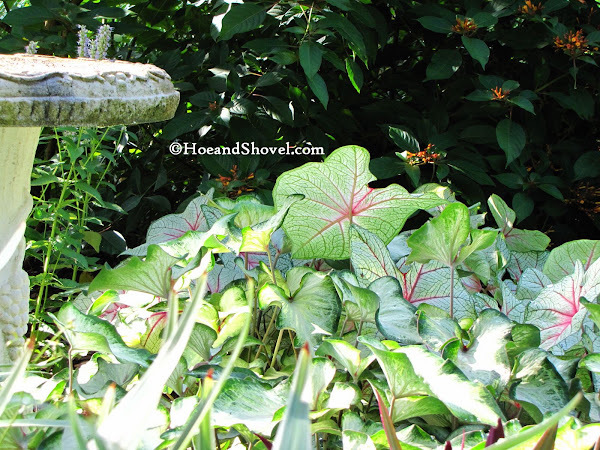 You can probably tell by now how easily caladiums adapt to almost any design and setting in the garden. And for this lover of foliage they have become my all-time-favorite plant for surviving our humidity and for supplying summertime color and impact. Everywhere. They blend as well with exotic bromeliads as they do with native firebush, Hamelia patens squeezed-in curvaciously between borders and the foundation plants we enjoy all year long. 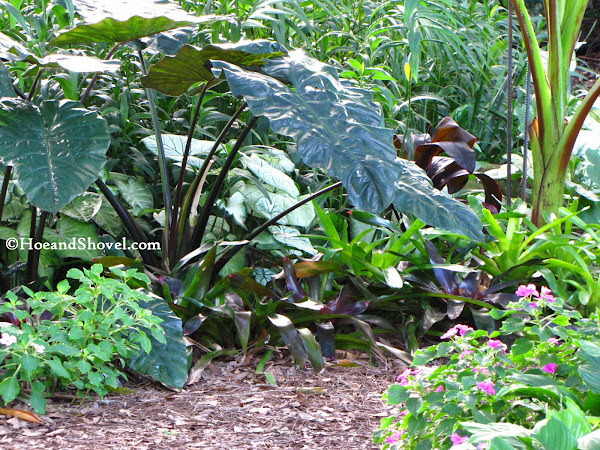 Offering big doses of tropical lushness they become companions to just about any and every other plant in all areas of the front and back gardens. I've not found them to require extra water even in the hottest months. Rainfall is sufficient for them. I can't remember ever having to give them extra irrigation. They do prefer a highly organic soil that has both good moisture holding capacity as well as good drainage. Container gardens are perfect for adding a pop of color with my favorite bulbs. And there's hardly a container here that doesn't display either a taller variety for the thriller or a shorter variety for filler. Red Flash. Both red varieties growing well in sunny spots or shade. There is a technique called de-eying for a fuller, more compact plant which I have not tried. But here is a good article on the process if anyone is interested. 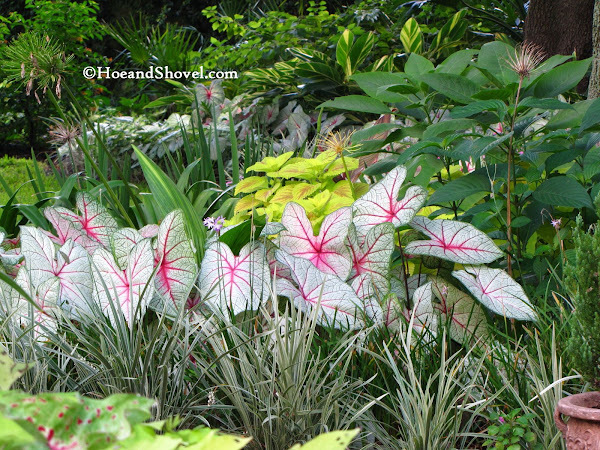 And for more on growing caladiums from the University of Florida Research Center go here. 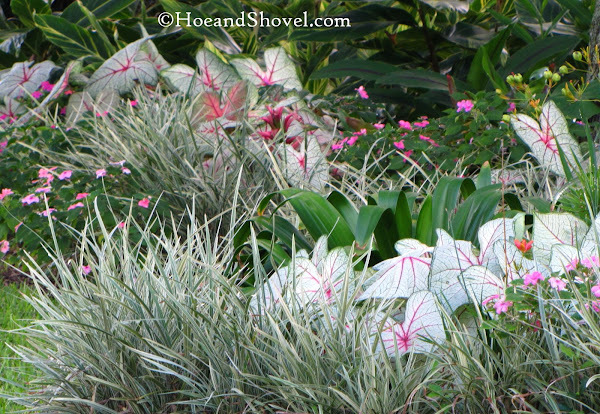 More Florida Fantasy mixed in with varieties of 'whites' in the front gardens. In the deepest part of the tropical pathway, where the dappled sun only shines well in the mornings, an all 'white' variety is tucked underneath the colocasias to draw the eye beyond the larger, dark leaves. A 'mix of whites' curving out in front of White Queen. 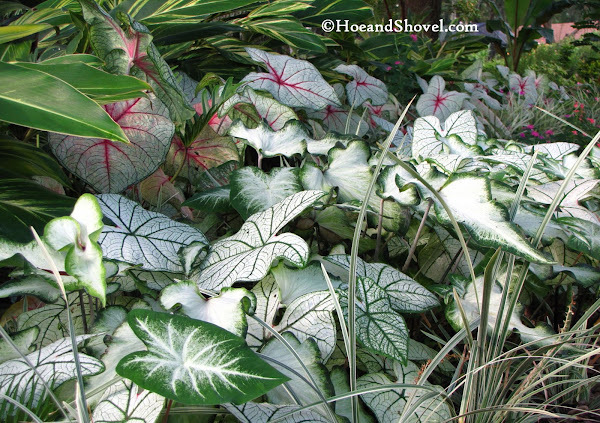 Caladiums have become the signature plant at Hoe and Shovel because I adore their uniquely patterned leaves while the considerable beauty of them inspires me thoroughly. I hope you love them too! 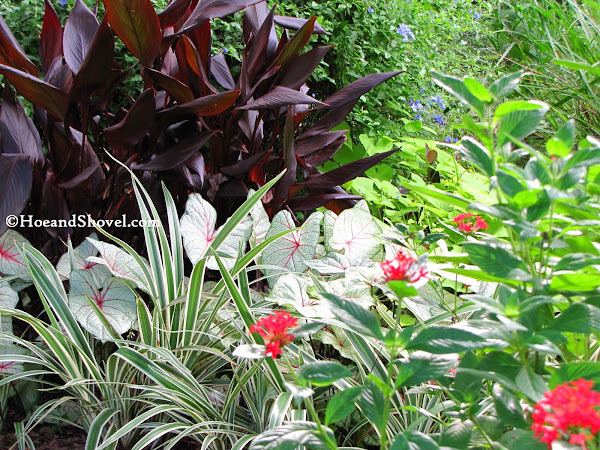 They will surely add joy to your gardens as they have mine if you give them a try! If you'd like to see more images (yes, there are more) of caladiums in my garden follow this link to view the entire album in Picasa. 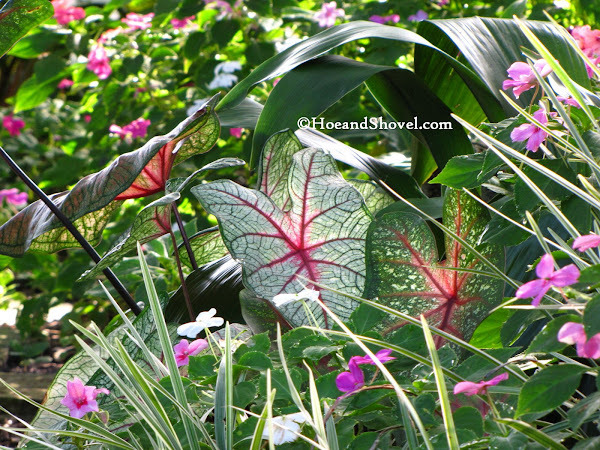 I just love all your caladiums, and they show up so well in your long stretches of gardens planted en masse. I dont believe we have such a variety available here, but i really must look for some of those white ones! OMG Meems, Meems Oh you have done yourself proud! Wow! 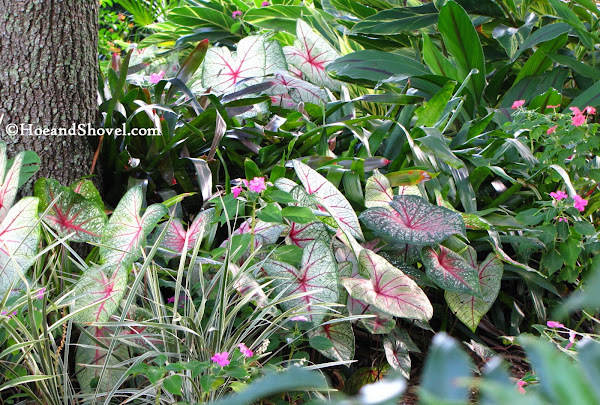 You are truly the Caladium Queen of central Florida. Thanks for the education, Meems. It's good to know that these beauties will grow in sun, as we have very little shade in our yard. Oh, Meems! 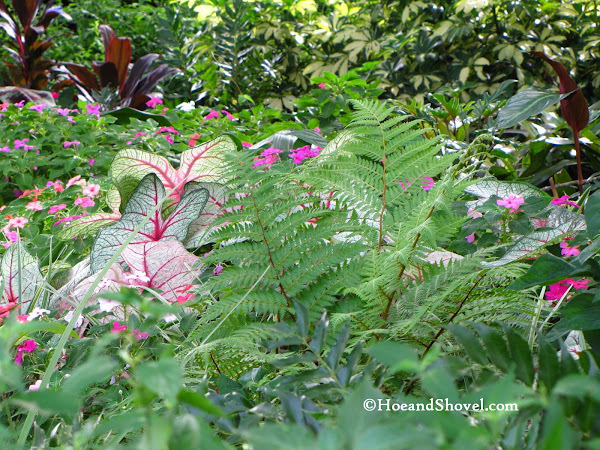 Once again, I am amazed by the stunning impact of Caladiums to the garden! 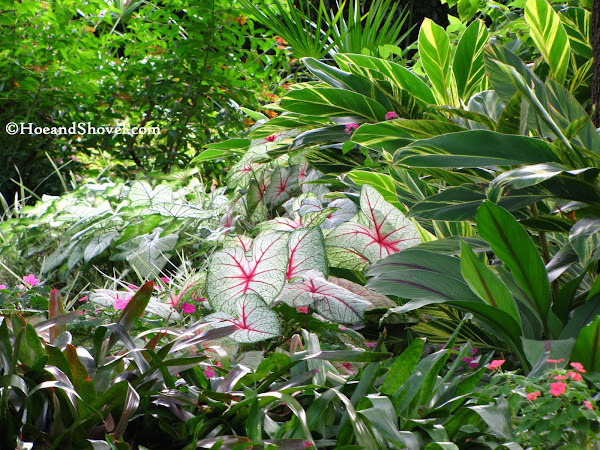 Yes, I have seen lots of caladium pictures of your garden, but everytime I see, I love them more, and I wish I can have that many space to plant more! I only have a couple of dozens planted this year, and surely will introduce more next year! Thanks again for the beautiful photos and an informational post! 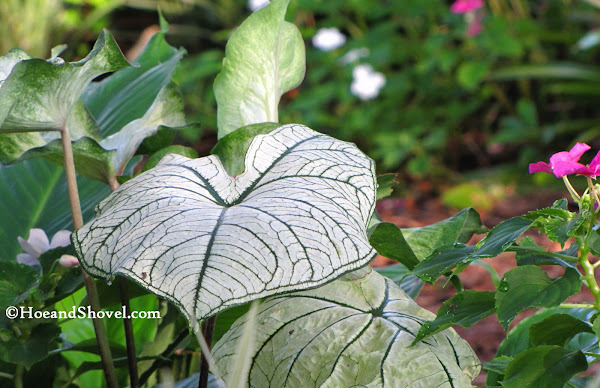 Love those Caladiums. Mine didn't come back like last yr. Must plant more. Your are to die for. Such beauty. Wow! 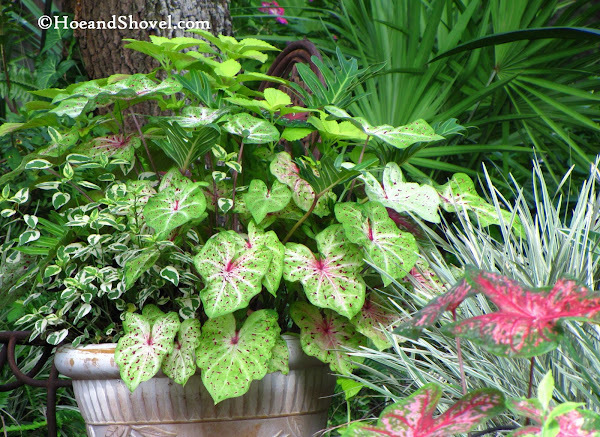 you have so many varieties of caladiums, I just love their colours and your flair in arranging their positions in the garden.You give me ideas where to plant mine though I have only one variety...I must look for more! Meems, these are lovely. I don't think they would like our summers, not hot or long enough for them. Thank you for taking such lovely photos for us to enjoy. You mentioned that you don't plant some new bulbs intil summer - how do you store them? 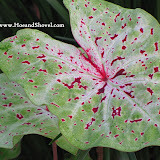 Wow, what a delight to see your colorful caladium post this morning. It must be a real joy walking around your gardens. Thanks for sharing a bit of your paradise here. 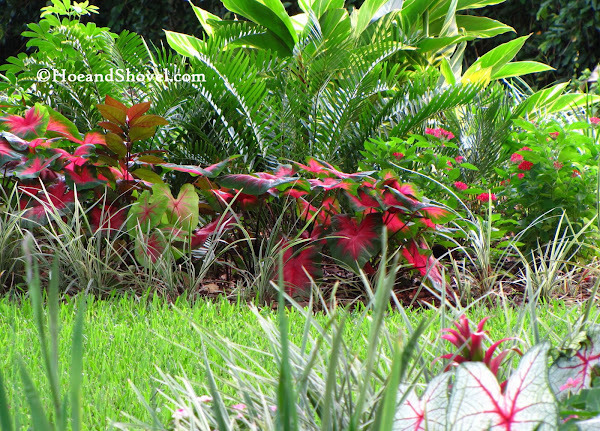 Your caladiums winding throughout all the garden areas really add color and interest. I just love the way you incorporate them. I've always lined mine up as a border. I've tried using them differently now that I've seen how beautiful they look curving through other plantings. Excitement - this is what I feel looking at these pictures! 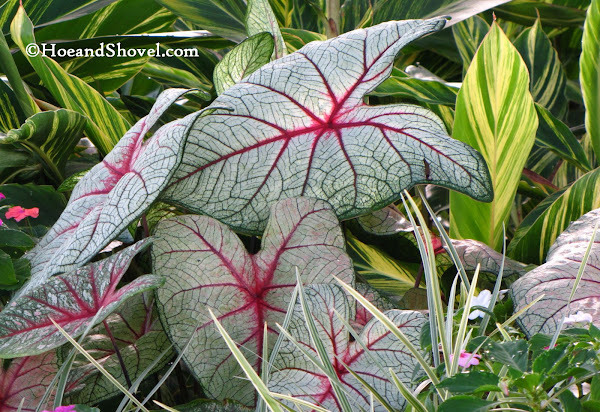 Meems, I remember your caladiums from the earlier posts, they are gorgeous, just a piece of art! More beautiful than last year if that's possible. I only had one return this year, I know it's because of the very cold winter we had. 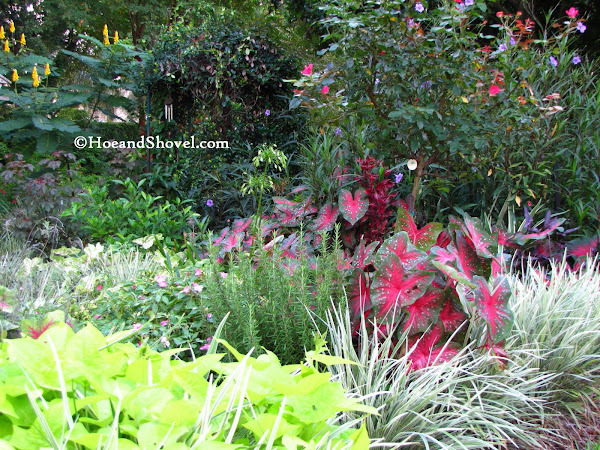 My elbow surgery slowed me down quite a bit in the garden this season so no additional caladiums were planted. Gorgeous and so lush! I can see why they're your signature plant! 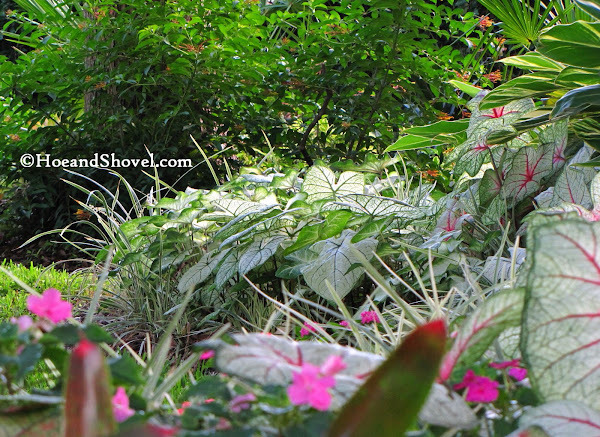 I love caladiums and they do well in my shade garden - but I do have to dig them up in the winter if I want to be sure they'll come back. You've inspired me to look for more varieties and plant more next year. 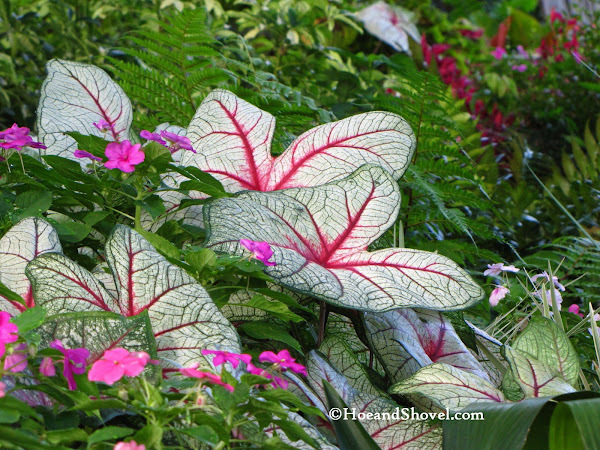 Hi Meems...I totally agree with you on caladiums...they are a "no-brainer" plant for the Fla. garden. Planted en masse (as you do in your garden) they really make a statement. I learned from my mom to de-eye them prior to planting and it really does make for a bushier growth of leaves. I really love your garden!!! The caladiums are great. I ♥ caladiums! Some were at the house when we bought it 2 years ago, I have bought a few bulbs and a friend had bought in bulk and gave me a few. Next year I am buying in bulk. 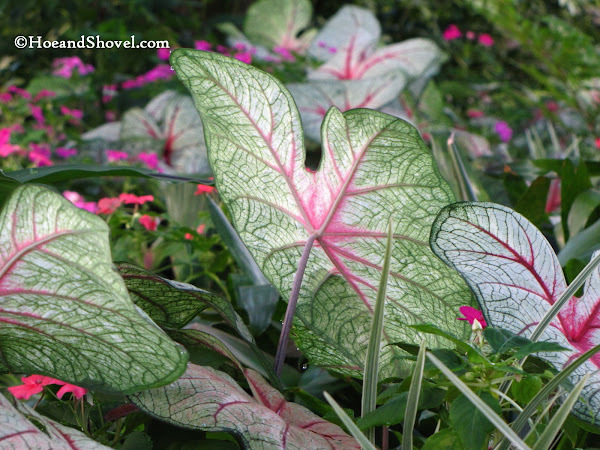 We are going to start using Caladiums in several of our park projects next year, so this is a very timely blog post! 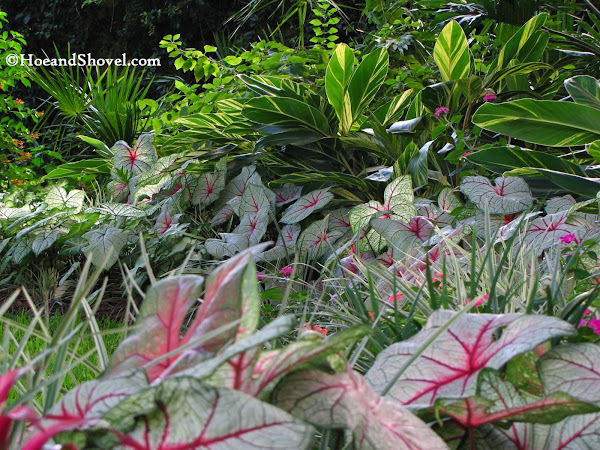 Meems, Your caladiums fit so perfectly in your lush tropical planting beds. I only order 100 bulbs each year but I am usually chomping at the bit to get them in the ground. I think I'll be trying your 'wait and see' approach next year. Two of my favorites are Scarlett Pimpernell and Miss Muffett - they both have lots of lime green. First, happy 32 years coming up! I hope you and Hubby have something fun planned. 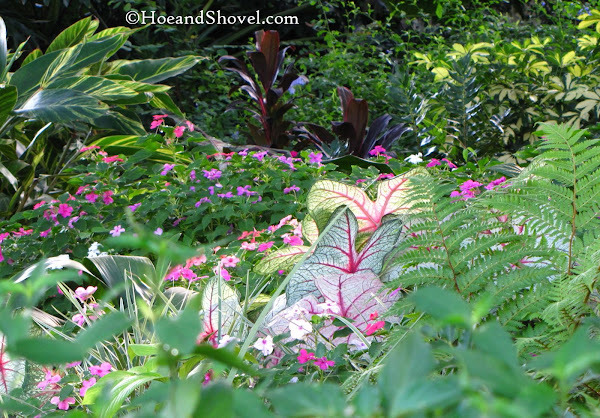 Your caladiums certainly rival any flower in floral land. I love every single one of them and so wish I could winter them here. Maybe I'll give it a go sometime. You inspire me! I just loved when I found your blog earlier this year & I just fell in love with your caladiums..I knew I had to have them. I bought 100 gingerland caladiums & although they were slow to start growing back in May, watching them take off now & seeing how wonderful they are, i'm completely sold & can't wait until next year when I go CRAZY and buy a few hundred. I just love them. 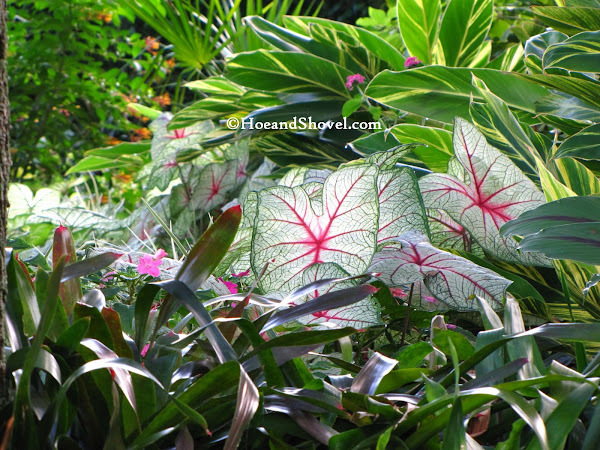 Thank you everyone for stopping by and for your kind comments regarding my caladium collection. 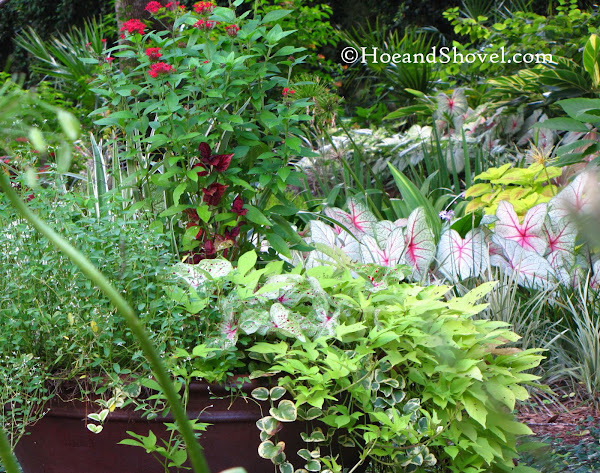 They truly are one of the easiest ways to spruce up the garden and provide months of joy. Good question. When I receive my orders of bulbs and don't plan to plant them right away firstly I open the box immediately to get air to them. Then I place them in another flat box (the bottom from a water bottle pallet works well)with shredded paper around them to keep them dry and somewhat separated. They can be stored like that during the winter as well. Just dig them up if you live in colder climates. Once spread and covered with shredded paper or some other light covering ~~place them in a cool, dry place until spring. Most of all have fun with them!